Mermaids are the most fantastic and beautiful princesses of the ocean. 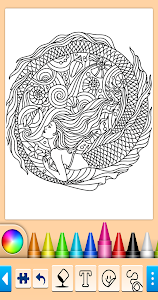 Come in and enjoy the mermaid painting and drawing salon. 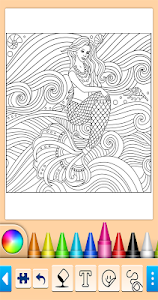 In this free coloring book game you find many coloring pages and pictures. This app is designed to be fun and easy to use for a mixed audience of all ages, from young to old. Easy navigation make it fun for grown up women, but also easy to use for girls. We get lots of positive feedback from women of all ages, kids, teenagers and adult women. Even grandparents find it fun to paint and color in this app. You can paint all designs with different colors and you can paint their hair, clothes, makeup and tail. But you also have the option to draw your own drawing or work with stamps and stickers. Also included are designs of fish and dolphins. When you're done and have made a nice picture you can easily store your design to use as wallpaper or share it with friends or family. - Mermaids in beautiful dresses with long tails and hair. - Playing with other animals like fish, seahorses and dolphins. - In love which kiss with merman. - Looking for treasures while diving under the sea. - A little mermaid excitement with scary sea creatures. 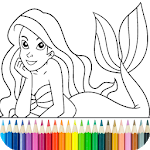 If you or your daughter likes mermaids she will also enjoy coloring and painting the models in this app. And with all the colors you can chose from you can also makeover and color the makeup, tails and hair of these beautiful girls. 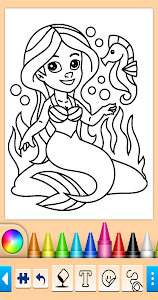 Can you make them look like a real mermaid? Or take a look at our other games with lovely designs for kids and adult. Drawing, painting, dress-up and makeover games to make beautiful pictures and stimulate the creativity of you or your son or daughter. 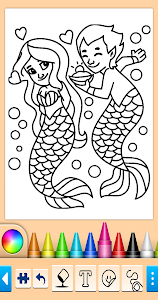 We have lots of free painting and drawing games for boys and for girls.